What is the Acerola Cherry? The acerola cherry (Malpighia glabra), also known as the Acerolla, Barbados cherry, or wild crapemyrtle, is a cherry type native to the West Indies and northern South America and is now being cultivated even in India. This cherry looks like your typical bright red one contaiantioxidant-fruits.comng 2-3 seeds and grows on a shrub, often with a thorny crown, that reaches about 3 meters in height when fully developed. 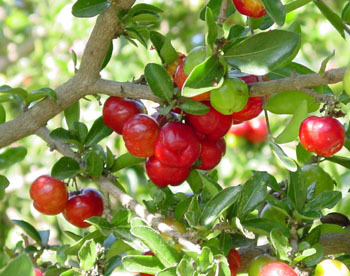 In the past, acerola cherries have been used to treat dysentery and fever. New research has suggested that this cherry is an anti-inflammatory and astringent. This cherry contains a high vitamin C, potassium, and magnesium content and has been found to have over 150 phytonutrients in it. Reportedly the richest source of vitamin C amongst fruits, the cherry is known far and wide for its health benefits, such as how it helps with the functioning of the immune system and bowel movements. This tropical antioxidant fruit cultivated mostly in the Caribbean, Brazil, Peru, Mexico, and India is a superfruit when it comes to its vitamin C content. A single cherry of rather small size contains 65 times more vitamin C than what is found in an orange. In other words, the vitamin C content found in one cherry is equal to the minimum daily requirement needed for your body. Isn’t that amazing? Who would imagine that such a small fruit could pack such a healthy punch? On top of that, human bodies absorb vitamin C from cherries better than they do from supplements. That’s just one more reason to trade in your vitamin pills for fresh fruit. Because of this, the cherry can help boost your immune system, strengthen your liver, improve the condition of your skin, and increase your body’s ability to repair its own tissues quickly. Colds, infections, hair loss, and dental problems are no match for the cherry. Its high levels of potassium can elevate mood, regulate heart function, and keep blood pressure in check. The folate present in cherries will help your body form new cells, reduce the risk of heart disease, and protect children against the risk of future mental health problems. This unique type of cherry has been used for centuries as a way to treat ailments like dysentery and fever. The hidden fighter in this fruit is the supply of vitamin C it packs. The cherry contains anthocyanins, which are substances that are highly anti-inflammatory in nature. This means it’s great at relieving headaches. Eating an acerola cherry can have the same effect as taking ibuprofen or aspirin for your headache. In addition, the cherry is an excellent source of vitamin A, which is a known antioxidant. One-hundred grams of an acerola cherry contains up to 1017 IU of carotene. Regular intake of vitamin A improves vision while reducing the risk of cataracts and macular degeneration. The cherry’s antioxidant properties mean it works to fight free radicals, which can have a negative effect on your skin. Eating more cherries leads to healthier, firmer skin. The antioxidants such as carotenoids and bioflavonoids in the cherry will reduce your chance of developing cancer or heart disease, both of which have become legitimate concerns in modern society. Consuming antioxidant rich fruits is a simple way to prevent these issues while you get to indulge in some truly delicious and exotic fruits. Learn more about Antioxidants in Tart Cherries. Thinking about cooking with cherries? You can always check out our Fruit Recipe Page to find unique recipes of specific fruits found on this site. Or be sure to check out Antioxidant-fruits.com’s fresh cherry recipes as well. Do you have a recipe with the Acerola Cherry in it? If so, please include it in the comments below or feel free to contact us. Where can I purchase fresh acerola cherries or are they available fresh in the US? I see lots of powders, etc., but would like to know where to buy FRESH. Thank you. I would try Whole Foods. – but I have no idea if they sell them fresh. You might also pose the question on the Antioxidant-fruits.com Facebook page to see if other folks have suggestions. Bolthouse Farms has a cheap smoothie drink you can get at almost anystore called C-boost. This drink contains 29 acerola cherries per bottle! It has 2400% vitamin C (real, not ascorbic acid) per bottle as well. This is what turned me on and I bought it. I never knew it had these cherries and real C in it, so I always passed it up. Well the drink has helped me a lot, and I just started it 2 days ago. I would recommend it. You probably only need one per day. I also like their perfectly protein drinks. That’s a good source of protein. Just reserached on google today…and just as I thought, you can survive off these drinks. They fill me up I noticed and I am not able to eat food with them. Hey, that’s great. Keep all those garbage chemicals in our food out of my body. If I’m never hungry…I could care less about eating! where can i get cheeris in india i want to by them.in india that to in hyderabad or visakhapatnam…………….. I have two of these bushes in my yard and just harvested 3 lbs of these cherries. The bush blooms and produces year-round. I really would like to find a recipe for them so I can preserve them. I am diabetic, so I cant use sugar. Any suggestions, anyone? I have cancer and grew up with a tree in my yard but now as a us citizen I can’t find it. I think it is what staved of my childhood cancer a bit. May I buy some seeds to plant from you please? If you have Acerola cherries and would like to send some to me I would be happy to pay you for them.